Acquired flat foot is a relatively common deformity encountered in the adult population. 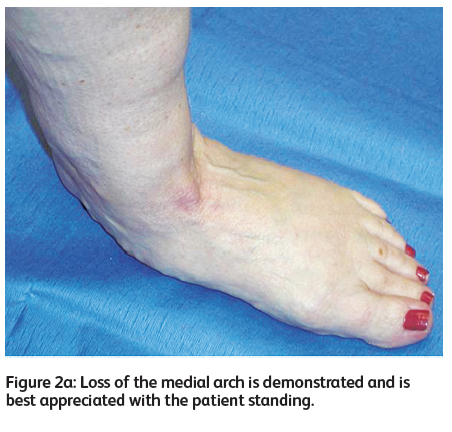 It can be defined as partial or complete loss or collapse of the medial longitudinal arch. Adult acquired flat foot can have a varied presentation. It is occasionally an asymptomatic incidental finding on clinical examination. However, symptomatic patients can have severe pain and instability leading to functional limitation. Early recognition and diagnosis is therefore important in order to initiate appropriate management. There are several factors associated with the development of adult acquired flat foot, the most common of these is the dysfunction of the posterior tibial tendon. The posterior tibial muscle takes its origin from the posterior aspect of the proximal tibia, fibula and interosseous membrane. It is located in the deep posterior compartment of the lower leg and is innervated by the posterior tibial nerve (Figure 1). The posterior tibial tendon then runs at an acute angle behind the medial malleolus in a fibro-osseous groove, encased in a teno-synovial sheath. It passes distally, anterior to the tuberosity of the navicular, where it divides. The anterior division of the tendon inserts onto the navicular tuberosity, the medial naviculo-cuneiform joint capsule and the inferior surface of the medial cuneiform. A second division attaches the plantar surfaces of the middle and lateral cuneiforms, as well as the cuboid and the bases of the second to fifth metatarsals. Finally, a posterior division inserts onto sustentaculum tali anteriorly (Figure 1). 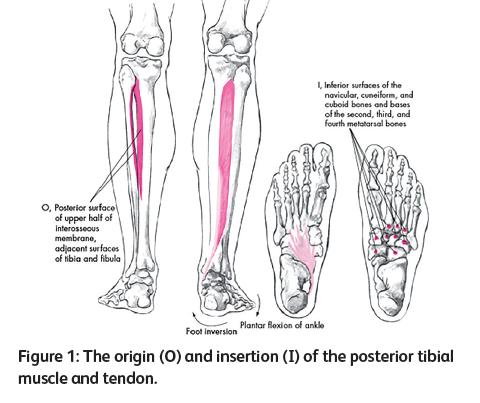 Tibialis posterior is responsible for plantar flexion of the ankle and initiation of inversion of the hindfoot at the subtalar joint; this occurs following the foot-flat portion of the stance phase in the gait cycle. Following inversion, the axes of the talonavicular and calcaneocuboid joints become non-parallel to allow the foot to become a rigid construct during the heel-rise and toe-off phases of gait. Also contributing to the maintenance of the medial longitudinal arch is the plantar calcaneo-navicular, or spring ligament. It is a broad, thick band passing from the sustentaculum tali of the calcaneus forward to the tuberosity of the navicular. It is the primary static stabiliser of the talo-navicular joint. Incompetence or rupture of this ligament can cause or contribute to increasing flat foot deformity. The underlying aetiology is multifactorial; posterior tibial tendon dysfunction (PTTD) is becoming increasingly recognised as the main causative factor leading to flat feet in adults. The posterior tibial tendon receives its blood supply from branches of the posterior tibial artery. However, there is an area of tendon distal to the medial malleolus, approximately 2cm to 6cm from the attachment to the navicular, where there is a zone of relative hypovascularity; this is thought to contribute to degenerative changes. Initial tenosynovitis can progress to significant tendinosis with an incompetent and painful tendon which lacks excursion. Fixed bony deformity can occur at later stages and ultimately lead to arthrosis. PTTD is more common in females and often presents in the sixth decade. The underlying cause can be varied; risk factors include inflammatory disorders such as rheumatoid arthritis, diabetes mellitus, steroid use or overloading of the arch from obesity or increased activity. PTTD results in abnormal loading of the transverse tarsal joints along with unopposed action of peroneus brevis; the resultant biomechanical stresses lead to collapse of the medial longitudinal arch and eversion of the subtalar joint. 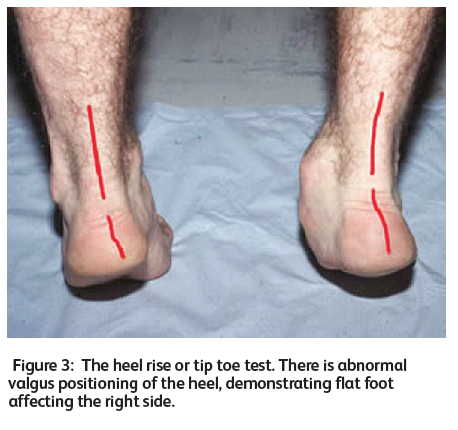 As a result, the heel assumes a valgus position and there is abduction of the mid-foot at the talonavicular joint. The valgus angulation of the hind-foot is likely a result of secondary changes, including stretching and incompetence of the deltoid ligament, the talonavicular joint capsule and the spring ligament. In addition, the abnormal valgus positioning of the heel results in the Achilles tendon acting as an evertor of the calcaneus as it is now positioned lateral to the axis of the subtalar joint, worsening the deformity. As PTTD progresses, secondary deformities can occur, including equinus at the ankle and increasingly horizontal orientation of the subtalar joint. The resulting contracture in the Achilles tendon leads to increasing sagittal motion at the subtalar joint instead of the tibio-talar joint; this can eventually result in impingement of the calcaneus against the fibula, with subsequent lateral-sided pain. Patients presenting in clinic often describe early medial-sided ankle and foot pain, which may have progressed to lateral-sided pain prior to presentation due to subfibular impingement. Swelling may be present if the dysfunction is due to tenosynovitis. History should elicit the onset of deformity, timing and progression of symptoms. Past medical history may be significant to include rheumatoid or other inflammatory arthropathies, diabetes mellitus or history of steroid use. Recent local steroid injection may also be responsible for precipitating symptoms. 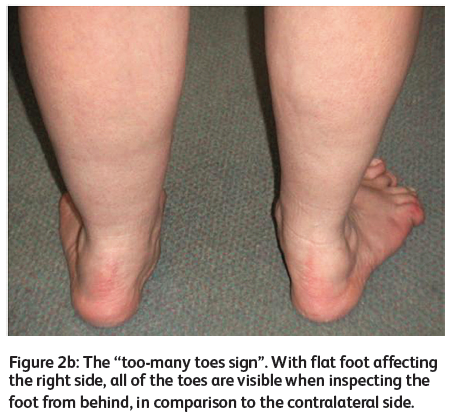 The occupation of the patient, level of physical activity and obesity may also contribute to the development of flat foot due to overloading of the arch. Footwear, history of trauma or any previous treatments received are also important factors to consider. Patients may report increasing difficulty in wearing shoes as the deformity progresses. Hip, knee or back pain may also be present in those with concurrent flat foot. The appearance of both feet should be evaluated while both sitting and weight bearing. Firstly, the patient should be examined while standing with both feet and the lower limb visible. The foot should be inspected from the side and above to appreciate loss of the medial arch; valgus angulation of the heel is best viewed from behind (Figure 2a). The too-many toes sign was described by Johnson in 1983 and is shown in Figure 2b. More of the lateral toes become visible when the foot is viewed from behind as more advanced deformity and increasing abduction of the forefoot occurs. The integrity of the posterior tibial tendon can be assessed using the ‘heel-rise’ or ‘tip-toe test’, The patient is asked to rise onto the ball of one foot while the other foot is already lifted from the floor. Normally, the posterior tibial tendon inverts and stabilises the hindfoot and the gastrocnemius-soleus complex then elevates the calcaneus. Posterior tibial tendon dysfunction results in abnormal valgus positioning of the heel on heel-rise or inability to perform this manoeuvre all together (Figure 3). If the patient is able to perform heel-rise initially, further stressing can be performed by asking the patient to repeat this task. The presence of any Achilles contracture should be evaluated and the tightness of gastrocnemius assessed using Silfverskiöld’s test. In a normal subject, ankle dorsiflexion will increase from 10 degrees with the knee extended to 20 degrees with knee flexion. With contractures, there will be an equinus deformity with the foot held in plantar flexion while the knee is extended, but with knee flexion to 90 degrees, ankle dorsiflexion significantly improves. Following completion of inspection and tests in a standing position, the patient should be further examined while seated. The foot should be palpated along the course of the posterior tibialis tendon to elicit any tenderness. The function and strength of the posterior tibial tendon can be assessed further, by asking the patient to plantar flex and evert the foot against resistance. The function of the spring ligament can also be assessed while sitting, through palpation while the patient performs inversion of the foot against resistance. The range of movement of the ankle and subtalar joints can then be assessed; this permits the important differentiation between rigid and flexible flat foot. If the subtalar joint remains mobile, any valgus deformity of the heel should be corrected to properly assess dorsiflexion; this ensures that movement is actually occurring at the ankle joint and not at the transverse tarsal joint. The position of the forefoot can then be assessed with the subtalar joint held in neutral. In early stage disease, the forefoot remains in a plantigrade position, however, as disease progresses the forefoot will gradually become supinated. In more advanced disease, rigidity of the subtalar joint will occur, making reduction of the valgus deformity of the heel impossible. 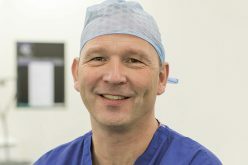 The differentiation between rigid and flexible flat foot is an extremely important one, as it is the main influential factor in deciding on treatment. The presence of an Achilles contracture, as well as the degree of mal-positioning of the forefoot, will also guide surgical treatment. Plain radiographs are the initial investigation of choice for diagnosis of acquired flat foot. Weight bearing antero-posterior and lateral views of the foot, as well as ankle mortise views are required. AP views are assessed for increased talonavicular uncoverage, where there is lateral subluxation of the navicular on the talus; this is an indication of forefoot abduction. A talonavicular coverage angle of greater than 7 degrees is indicative of subluxation. 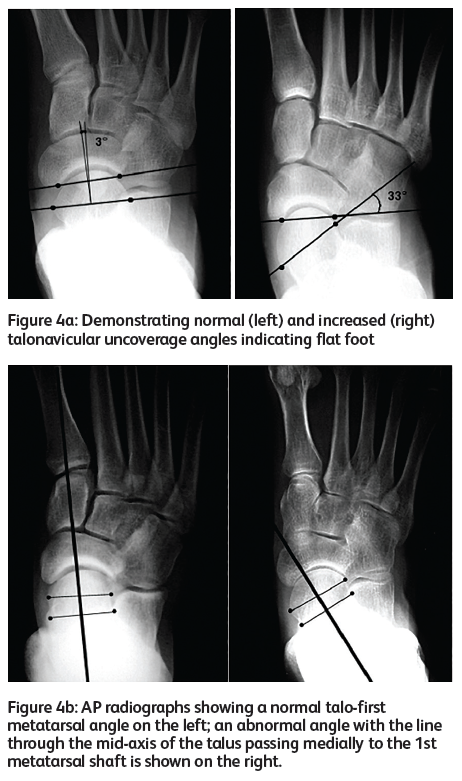 The talo-first metatarsal angle also provides information on the stage of disease. When examining an AP radiograph, a line drawn through the mid-axis of the talus should pass through the base of the first metatarsal (Figure 4). Talar first-metatarsal angle (Meary’s angle): the angle between the long axis of the talus and first metatarsal. An angle greater than 4 degrees convex downwards is seen with flat foot. 15-30 degrees is considered moderate and >30 degrees severe. (Figure 5a). Decreased calcaneal pitch: normal pitch is between 17-32 degrees, anything less than this is a result of decreased arch height (figure 5b). Decreased cuneiform floor height is also indicative of loss of arch height (normal distance is 15 to 25mm). Subtalar arthritis, seen in later disease stages. Ankle mortise views are assessed to visualise talar tilt. MRI is not essential in the diagnosis of flat foot, however it is a useful tool in assessing the integrity of the tendon; it is thought to have a sensitivity of 95 per cent and specificity of 100 per cent. The size, shape and internal signal of the tendon can be visualised and should be scanned from above the medial malleolus to its insertion on to the navicular. Tenosynovitis, along with tears, ruptures and degeneration can all be visualised on MR scanning. Conti et al developed a MRI-based classification of posterior tibial tears, summarised in Table 1. 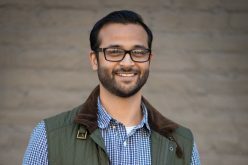 Ultrasound is also a cost-effective and accurate method for evaluating tendon dysfunction, but has the disadvantage of being extremely user dependent. A normal posterior tibial tendon has a diameter of 4-6mm and is hyperechoic. Tenosynovitis presents with a large amount of fluid surrounding the tendon, with the classical finding of a hypoechoic rim. Ultrasound may also reveal tendon swelling, splits, or an empty tibial groove at the level of the medial malleolus in cases of rupture. Ultrasound may be most helpful in early stage disease in order to identify the extent of tendon dysfunction. Johnson and Stromm were the first to classify flat foot in 1989, describing three stages. Stage I involves painful synovitis of the posterior tibial tendon, but no clinical deformity as tendon function is normal. Stage II describes progressive failure of the tendon with flexible deformity. In Stage III there is rigid deformity with degenerative changes in the mid and hind foot. A fourth stage was subsequently added by Myerson in 1997, describing those cases with valgus tilting of the talus within the ankle mortise and associated deltoid incompetence, with or without the presence of tibio-talar arthritis. Further to this, the four stages have been sub-classified with respect to the severity and flexibility of forefoot supination when the hind-foot is brought into neutral position. 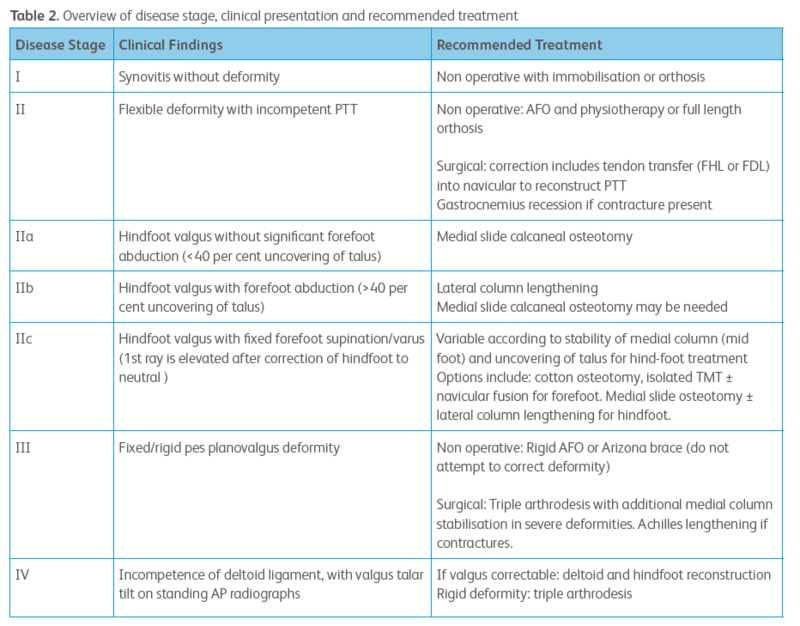 The aim of this additional classification was to provide guidance on treatment options and is summarised in Table 2. There are a variety of treatments available for adult acquired flat foot, both non-operative and operative. The decision is mostly dependent on symptoms, stage of disease, underlying cause as well as patient co-morbidities. Most symptomatic patients with tendon dysfunction but no structural deformity can initially be treated non-operatively with analgesia and physiotherapy. Approximately 80 per cent of patients with stage I and II (A and B) disease respond positively to non-operative measures. The aim of treatment is to provide support for the arch and reduce forces transmitted through the postero-medial hind foot with a view to reducing medial collapse of the foot. Specific footwear includes extra-depth shoes which can accommodate insoles and a high toe box. 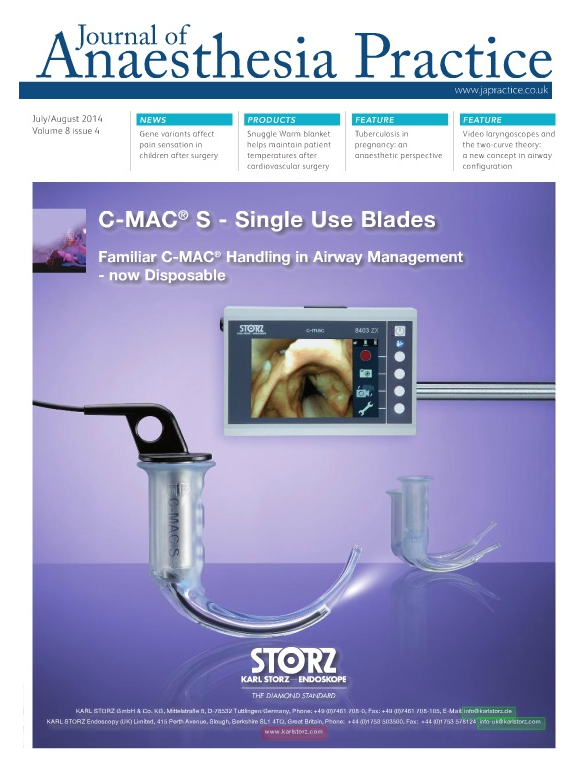 Where relevant, patients are encouraged to modify activities and reduce weight. In acute synovitis of the posterior tibial tendon, a period of six to eight weeks of immobilisation in a fitted removable boot can improve symptoms in early stage disease. This should prevent overuse and subsequent rupture of the tendon, with weight bearing permitted as tolerated. Following this, the patient is usually fitted with a foot orthosis and referred for physiotherapy for eccentric stretching exercised of the gastrosoleus complex. Custom-made orthoses can be useful in stage I or early stage II disease in order to hold the subtalar joint in neutral for those patients with lateral pain due to subfibular impingement. An ankle foot orthosis (AFO) can be used in stage III disease; this provides stability and prevents plantar flexion and pronation of the foot, thereby limiting excursion of the posterior tibial tendon. The most important factor to consider when deciding on surgical management of adult flat foot is whether the deformity present is fixed or flexible. 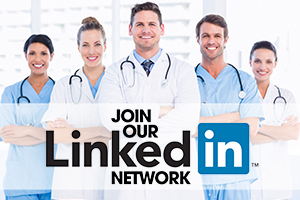 The second consideration is whether to preserve or sacrifice the joint; this will largely depend on factors including patient age, functional status, degree of deformity, co-morbidities and presence of arthritis. In patients with stage I disease with symptoms refractory to non-operative measures, synovectomy may be considered. The sheath is exposed along the length of the tendon from the musculo-tendinous junction to its insertion onto the navicular. The synovectomy should be performed by sharp dissection, removing all inflamed tissue, while preserving the blood supply to the tendon. Tendon transfer can be performed for patients with weakness, valgus angulation of the hindfoot and pain in the midfoot but who still have a mobile subtalar and transverse tarsal joint. If there is inadequate movement in these joints, this procedure will fail. Most papers advocate the use of flexor digitorum longus tendon to replace the ruptured posterior tibial tendon. The use of flexor hallicus longus for tendon transfer has also been described; although this tendon is stronger, it is closer to the neurovascular bundle and there is greater donor site morbidity. In addition, the proximity of FDL to posterior tibial tendon makes this a more suitable choice for transfer. Following reconstruction, the patient should be non-weight bearing for four weeks with a further period of four weeks protected weight bearing. Calcaneal osteotomy can be used in stage II disease to treat valgus angulation of the heel. The osteotomy moves the calcaneus medially thereby altering the mechanical axis of the lower limb, resulting in a reduction of the valgus force on the midfoot. Through displacing the calcaneus medially, the axis of the pull of the gastrosoleus complex is moved medial to the subtalar joint, increasing its varus pull on the hindfoot. A transverse osteotomy is made in the calcaneus perpendicular to the lateral border of the calcaneus and is inclined posteriorly by 45 degrees to the sole of the foot. The posterior fragment is then displaced 1cm medially and fixed with a cancellous lag screw (Figure 6). Evans procedure: an osteotomy is performed in the calcaneus parallel to the calcaneocuboid joint, ensuring the medial cortex is preserved. The osteotomy is distracted and filled with an iliac crest bone graft or femoral head allograft so it is flush with the lateral surface of the calcaneus. 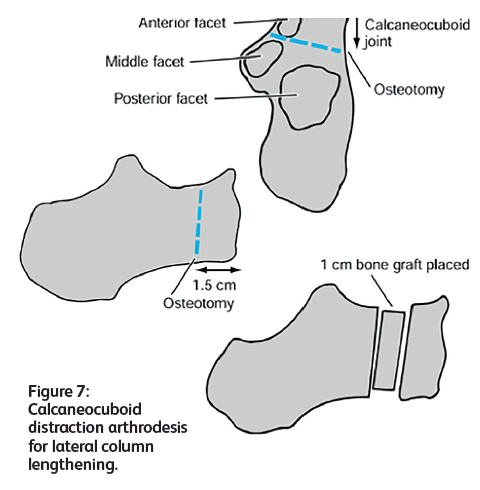 The graft is then fixed with either a pin or screw, ensuring the calcaneocuboid joint is not penetrated. The latest technology of the use of in the ‘internal brace’ by Arthrex Inc., has revolutionised treatment of flat foot. 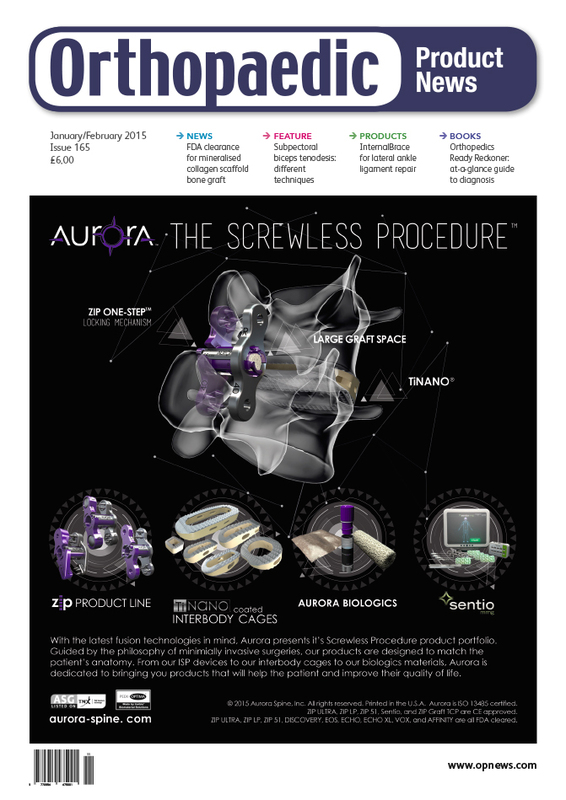 This device addresses not only flatfoot, but the augmentation of the spring ligament. The internal brace peek screws are inserted in the sustanticulum talus and the navicular in a tunnel. 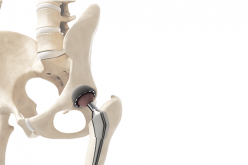 The advantage of this technique allows patients to return to early mobilisation and significantly reduce the immobilisation period. The use of the ‘internal brace’ does not replace previously calcaneus osteotomy and FDL tendon transfer. Various methods of arthrodesis have been described including isolated talonavicular, talonavicular and calcaneocuboid, subtalar and triple arthrodesis. Such procedures are indicated in patients with rigid deformities of the hindfoot. Isolated subtalar fusion can be used in patients who have a fixed deformity at the subtalar joint, but where there is a pain free transverse tarsal joint with preservation of mobility. This allows deformity correction and symptom relief while maintaining movement of the surrounding joints. 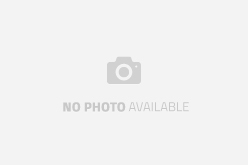 Triple arthrodesis is chosen for patients with a fixed hindfoot deformity along with lateral sided pain and fuses the talonavicular, subtalar and calcaneocuboid joints. 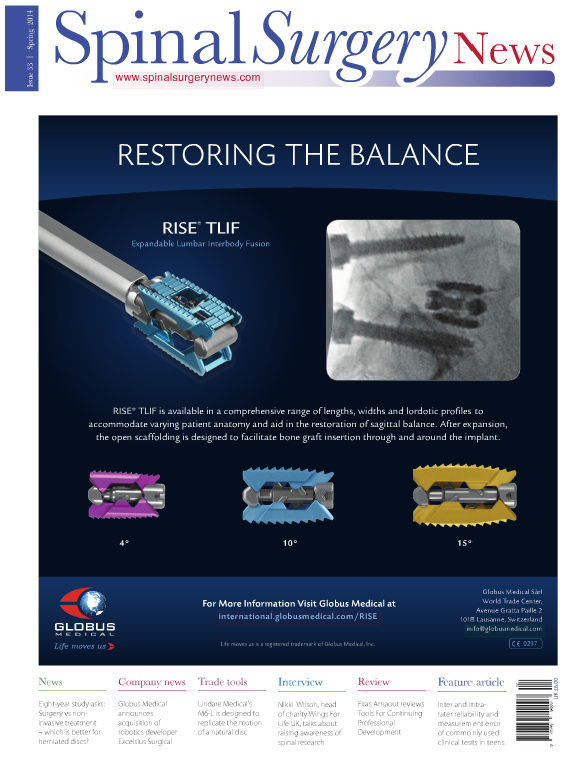 This procedure allows realignment of the hindfoot, while establishing a plantigrade weight bearing surface and maintaining the integrity of the ankle joint. In certain situations, even a tibio-talo-calcaneal fusion or pan-talar fusion might be considered. Adult acquired flat foot is a very common condition. Can cause significant pain and functional disability. 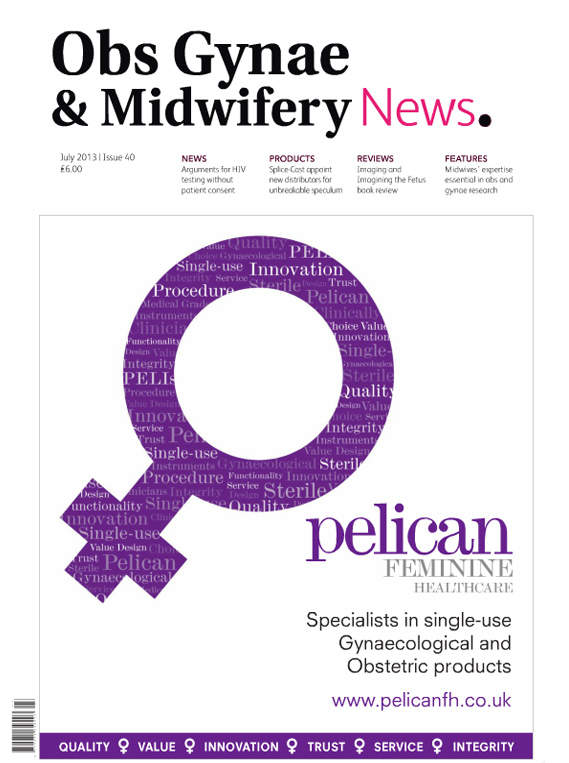 Thorough history taking and focused examination aids in early diagnosis. Treatment is varied according to the stage of disease and the presence of fixed or flexible deformity. Early recognition is important as outcomes for both non-operative and surgical interventions are better for early stage disease. If left untreated adult acquired flat foot will ultimately progress to significant arthritis.